Our two-bedroom , two bathroom apartment is located in a gated community at Novotel Twin Waters Resort on the beautiful Sunshine Coast. 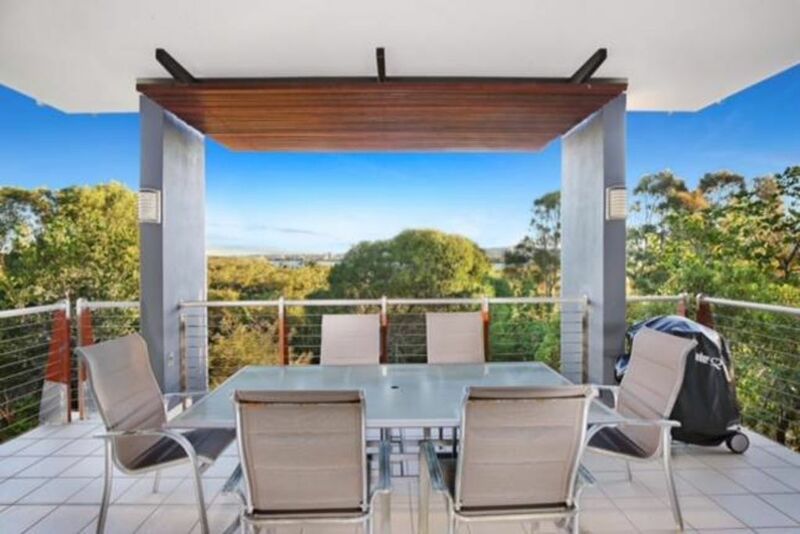 It has underground parking and a swimming pool opposite the front door of the building, The first floor apartment has a separate laundry, Austar, Wi-Fi, Barbeque on the balcony and stunning views of the Maroochydore River. It is only a few minutes walk to the river, the beach or the main lagoon in the centre of the Resort. The unit is part of The Sebel, Twin Waters complex and as such has reciprocal access rights to all the Novotel Resort facilities. The Sunshine Coast airport is 10 minutes by car, restaurants and shops are within walking distance and it is a 15 minute drive to Maroochydore and the Sunshine Plaza shopping centre. The resort runs a shuttle bus to the Golf Club which is only two kilometres away. There are three beds available, a King in the main bedroom and two singles in the second bedroom, however the second bedroom can be made up into another King, so we have the perfect set-up for couples travelling together. There are two car parking spaces provided in the underground carpark, so perfect if you are bringing two cars or a small boat or trailer. Hotel quality linen is used throughout the apartment, however no beach towels are provided. These can be hired from Sebel reception. My husband, Rick and I have lived on the Sunshine Coast for 24 years and love the area. We live on the Twin Waters Golf Course approximately 2km from our unit, so we are available for our guests should they have any questions. We have three children, three granddaughters and have been married for 35 years. We love that our property is part of the highly regarded Sebel group and as such can offer you high quality accommodation, good service and reasonable rates. Novotel Twin Waters Resort is adjacent to our property and so our guests have reciprocal rights to all facilities at the Resort. Just by showing your room key at the Activities centre you are provided with armbands just like any other Resort guest. We love the views of the Maroochy River from our balcony and listening to the sounds of the ocean as you drift off to sleep. A 5 minute walk around the beautiful lagoon and all the facilities of the beautiful Novotel twin Waters resort await you. You will be surrounded by water in three directions, the river, the ocean and the lagoon! This is a very quiet and relaxing area and you can feel perfectly safe in this totally gated community. The living room has a cosy lounge, large screen TV, Austar and an arcade table game (providing 64 different games) for your enjoyment. We have provided gladwrap, alfoil, sandwich bags, paper towel and salt and pepper. The Games Room is located at the Novotel Resort and has a $10 Happy Hour which runs on Friday and Saturday nights every week as well as every night of the week during school holidays!!! The pool is located directly outside the building but there are also a number of other pools on the property. We stayed here over Easter with family of ours staying in another one of the apartments & it was such a great spot. Having previously stayed at the Novotel across the lagoon we knew it would be busy there over the holiday period, so the Sebel was a much better option. It was quiet & comfortable (apart from a fire alarm that woke us on the last night!). As a guest of the Sebel we still had access to all the facilities at Novotel (kayaking, catamarans, pools etc). The apartment is bright, airy & spacious with everything you need! The beds were super comfy and it was great having Foxtel. The whole family loved the arcade game table. The Sebel wifi is a bit sketchy but we had our own so that wasn’t an issue for us. We enjoyed walking to the beach and river, and loved the view from the balcony. We also really appreciated Robyn our host organising an early check in for us, and the gift of Easter chocolates and wine she left us. She also delivered us some batteries when we discovered the TV remote had none! We had such an enjoyable Easter break and would highly recommend this apartment. We are so thrilled you enjoyed your stay and loved being close to the beach and enjoyed the sights and sounds of nature. Loved our stay here & the gifts that were left were well appreciated. I’m glad the boys had a great stay....I hope the golf game went well too!! Look forward to hosting you again. Thanks for your fantastic review Brad, we are thrilled that you had a great stay. Loved seeing the Maroochy river from the deck. The apartment is immaculate with lots of room to move. Checking in was easy and the services of Twin Waters itself were so convenient. Unfortunately there was a little weather system called Cyclone Oma that was hovering around so the beach was wild and windy. However the weather did not dampen our stay. We’ll be back. We appreciated the kitchen being well appointed and secure underground parking. Peaceful spot with lovely views. Thanks for your lovely review Lisa and Mark, we endeavour to make a place feel "just like home".